Have you wondered about the differences in belief systems? How belief systems are related to one another? The study of Philosophy and Religion will increase the capacity to think critically and consistently, to organize ideas and issues, to look at issues from a variety of viewpoints, to solve problems, and to manage people and lead effectively which are all important skills in today’s modern job market. A background in Philosophy and Religion is useful for a wide variety of careers such careers as Law, Public Relations, Business Management, Publishing, Public Health, and Pastoral Care. Barton Community College's Philosophy and Religion curriculum is designed to provide the general education requirement and core Philosophy and Religion courses for students who plan to transfer to a four year college or university to complete a bachelor's degree in Philosophy and Religion. In addition to general education courses like Intro to Philosophy and World Religion, we offer a variety of electives including Ethics and New Testament courses. Electives must meet the requirements of your transferring institution. Students should coordinate with their advisor for transfer requirements. 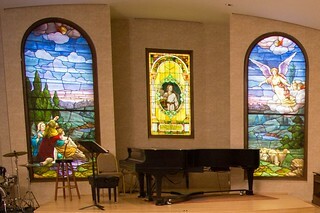 The Dorothy Moses Morrison Chapel is a showcase for five historic stained glass windows donated in 1991 by Mrs. Morrison. The windows were restored in 2001 and placed in the renovated chapel. Learn more about tours, renting the Chapel and more on the Chapel webpage.